There's an old debate on whether or not Doom is just a fancy ray caster game, that it's simply a beefed up version of the Wolfenstein 3D engine. True, however, this is what Doom may have looked like if it was built using only the original Wolfenstein 3D engine, in this case the Raycasting Game Maker engine has been used. All graphical and sound effect content belongs to ID Software. Midi Music tracks owned by ID Software, Rogue Entertainment and 3D Realms. Game Engine is Raycasting Game Maker, curated by the RGM Team on IndieDB & ModDB. There are many custom titles designed for this engine as you probably know-- seeing as you are aware of this title and have downloaded it. If you would prefer to delete the batch files and run the game modes directly from the folders you can. Delete ddraw.dll from the game directory and try again. Sometimes when you Alt+Tab in and out of the game window and then try to resize the window--the window shrinks down to the minimal possible size. Restart the game if this happens. Sometiems moving the game window around on the desktop causes the menu screen to freeze overthe actual gameplay window. Alt-F4 if necessary. Occasionally some of the doors won't open and you can hear the door open and close sound echorepeatedely during game play when this happens. Restart the game. Slow to quit or screen stays black for a few seconds on start or quit: Delete ddraw.dll from the game directory. To run the game in GodMode, execute the appropriate batch file as mentioned in the first sectionof this document. 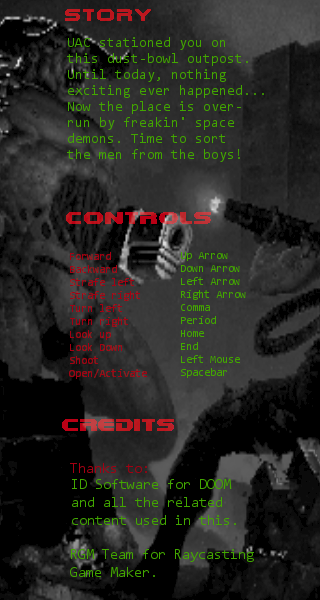 In GodMode, you will be invincible, have unlimited ammo on all guns and alwayshave the exit key. This was the last test build before v1.01 was finished. This was the second test build made after setting up the weapons and making a basic level. The first test build of the project made after importing the basic sprites and textures into the RGM editor.